For those of you wondering how much it costs to build a minimal viable product or MVP app and how much more you’ll need to take it to the next level, here’s an infographic to illustrate the evolution of a real app from MVP to “final” product. 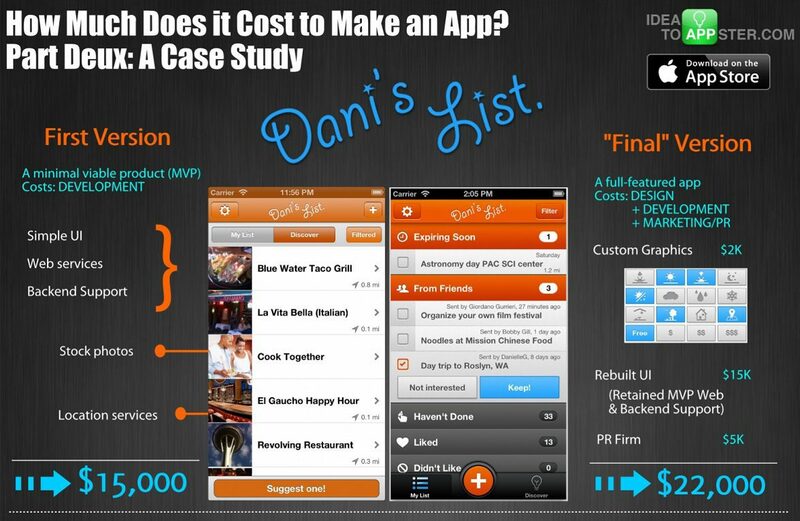 The app is Dani’s List, the fun-to-do list of things you actually want to do! This app is published by New York based app developer, Blue Label Labs, and the first post-MVP version of the app was just released this week. To the left you’ll see the costs to develop and release the MVP version of the app, and to the right is the “final” version with the additional cost to take the MVP and make it into a full product. According to Blue Label, they were able to leverage all of the backend architecture built for the MVP in the final version, while spending most of their time rebuilding the UI based on what they heard from users of the MVP. Want to know more? Check out our first infographic on How Much Does it Cost to Build an App? Design costs – Custom art work and design to round out the look and feel. Development costs – UI was rebuilt from the ground up. Marketing costs – Marketing (e.g., promotional videos, website) + PR firm working with blogs/press outlets.